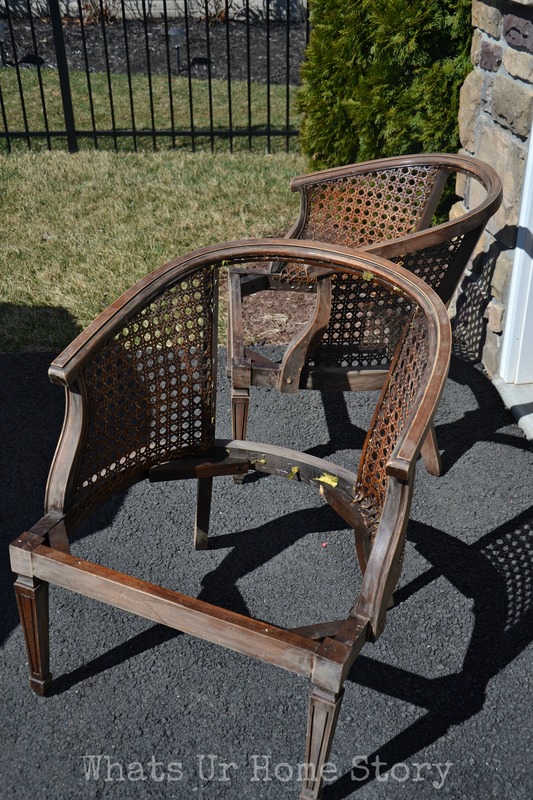 To recap, after much searching I found two adorable cane chairs on Craigslist around this time last year. While I took my own sweet time trying to decide on what I wanted to do with them, they gathered dust in my already messy garage. More design prodding followed and eventually last November I decided on the fabric. Now, exactly a year after I got them, the musty Kermit frog green velvet is off. The left side is using the clear wax (what I have) to finish while the right side was finished with the dark wax. I was leaning towards the dark wax look but didn’t want to spend $30 on getting a large tub of dark wax that I would hardly use. My clear wax tub is still intact. Wish ASCP waxes came in smaller tubs! Anyways off to Home Depot I went and the guy there suggested Kilz! 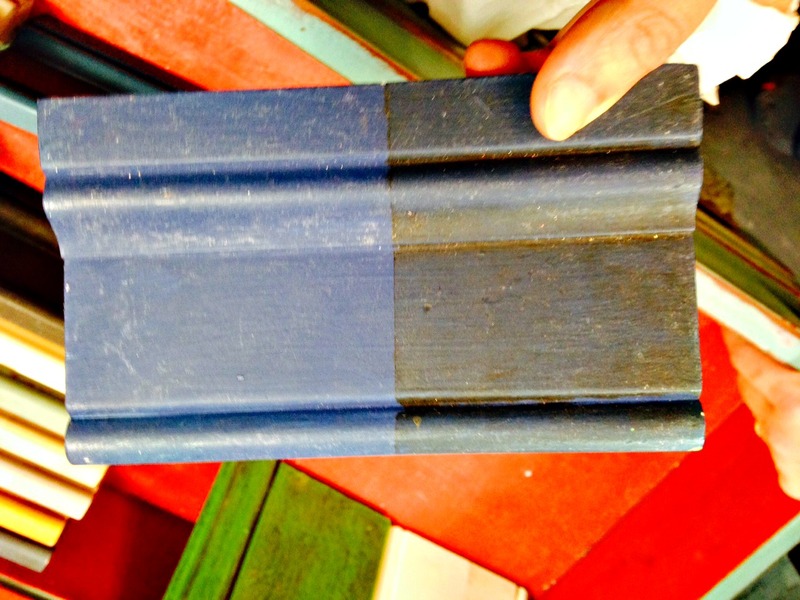 And I was like, “Why didn’t I think of that?” Every blogger worth their furniture repainting worth swears by this gem and I had totally forgotten about it! 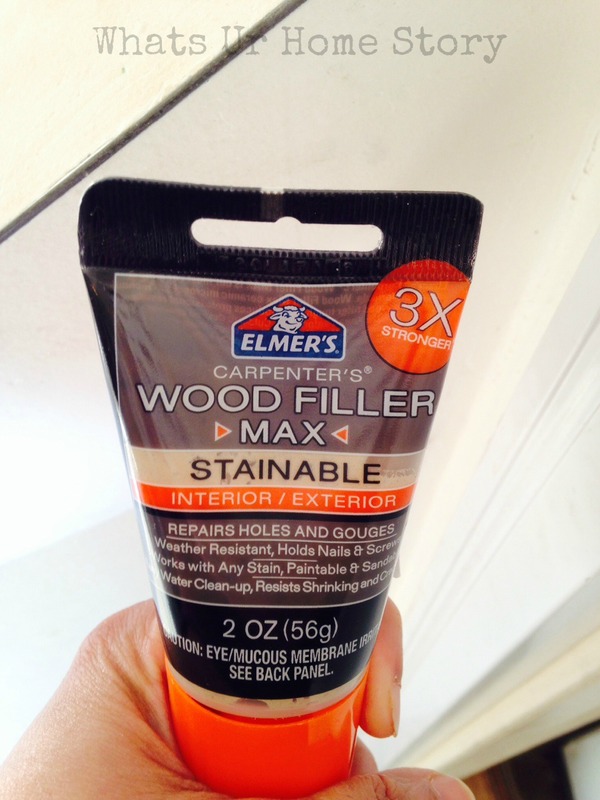 Oh, and I also used Elmer’s Wood filler to fix a few dings and dents on the chair. One thing I realized during this endeavor is that when it comes to paint, I’m very fickle and I change my mind at the very last minute. Contrary to all my plans I walked into Home Depot and just a picked a paint strip that spoke to me (Isn’t that a normal thing? Don’t paint strips talk to you?). I mean, even I couldn’t believe myself, after all that planning! I just walk into the store, go to the paint section, decide on what I want then and there and order my paint! I did the exact same thing for the laundry room herringbone ceiling! 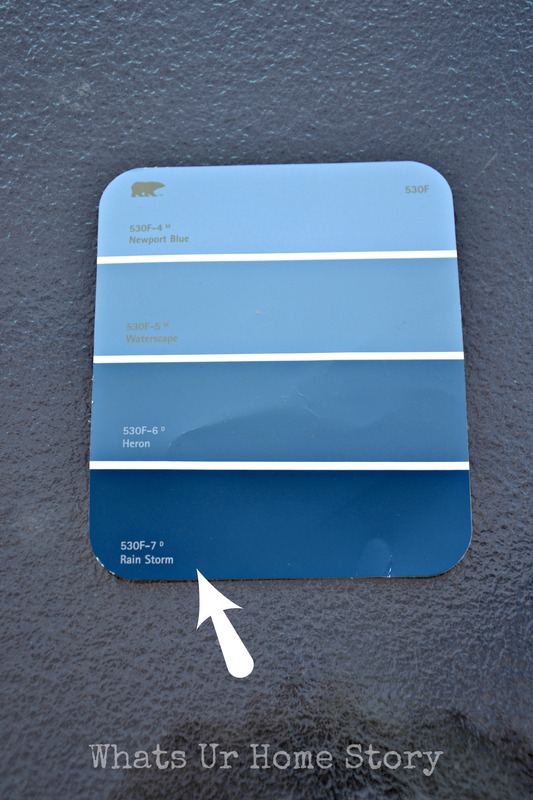 At least this time, I ordered only a sample pot of Behr Rain Storm, the darkest one on this strip. Even B is skeptical of the paint color but my heart says it will all fall into place in the end. Wish me luck folks, gonna paint today. Have you made on the spot paint decisions in the store? How did it go? 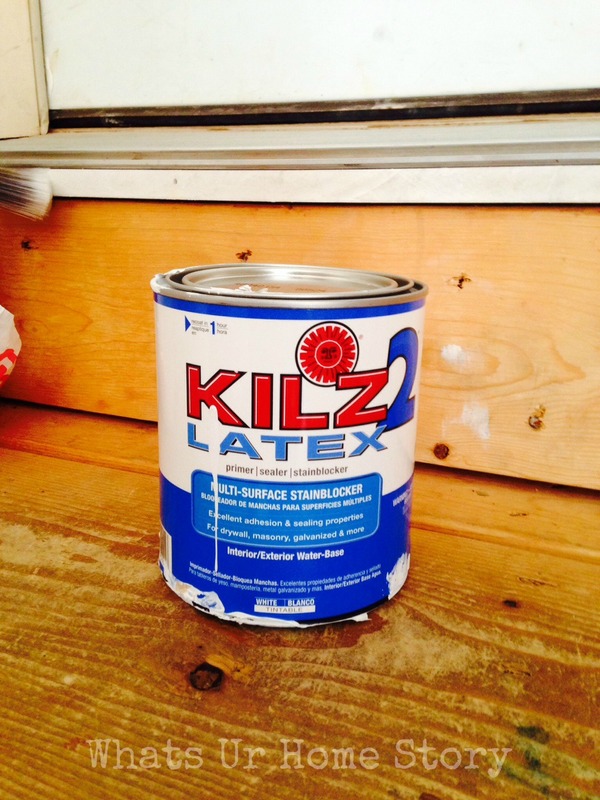 Vidya, I have used Kilz primer spray on a laminate bookcase and it really works. 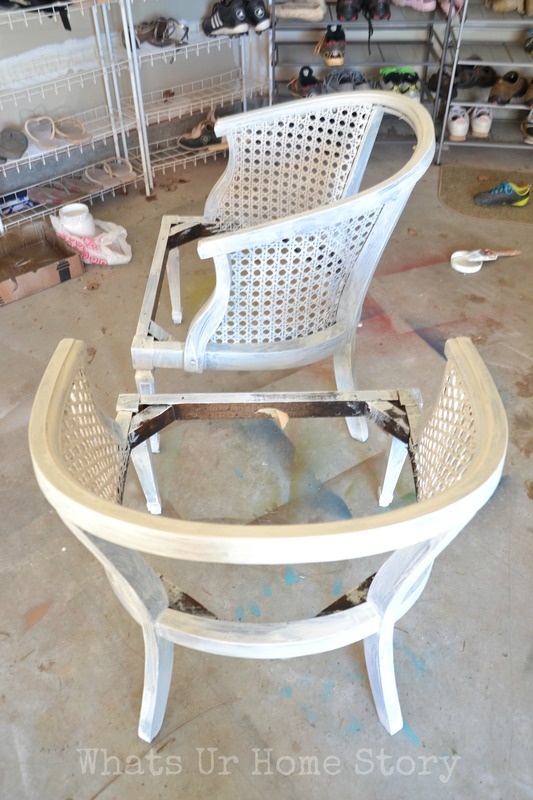 Waiting to see your chair makeover….good luck with the paint job. Your garage looks lot cleaner than mine. Oooh, I like your picks! The blue looks great, looking fwd to the finished paintjob! And curious to know what fabric you will use for the cushions. wow! 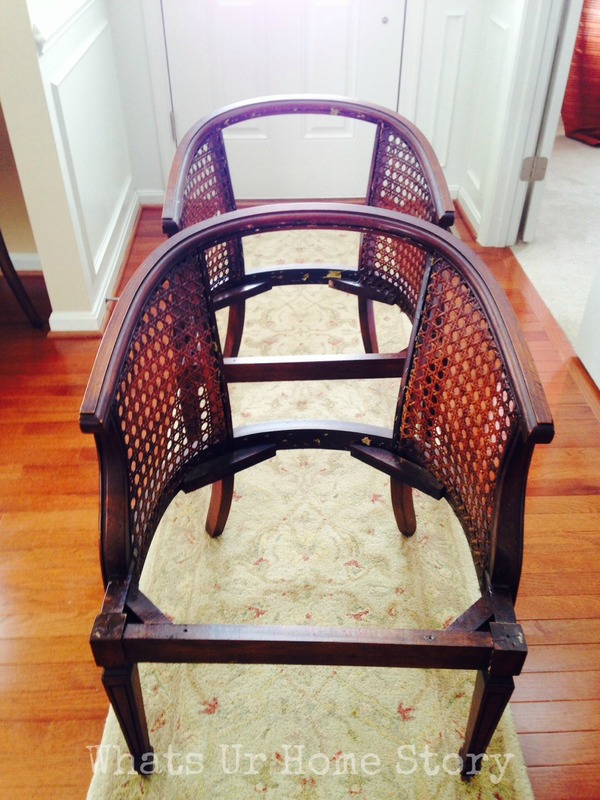 can’t wait to see the makeover of these colonial cane chairs Vidya. I found – stole a pair of the same chairs at a local Goodwill for $9.99 a chair. Now that I have them home I am stumped with what I want to do with them. At least I know I will Kilz me some chairs first and then decide!! Now you have helped me again! Can’t wait to see your finished chairs, and WHEN I finish I will show you mine! LOVE the results. 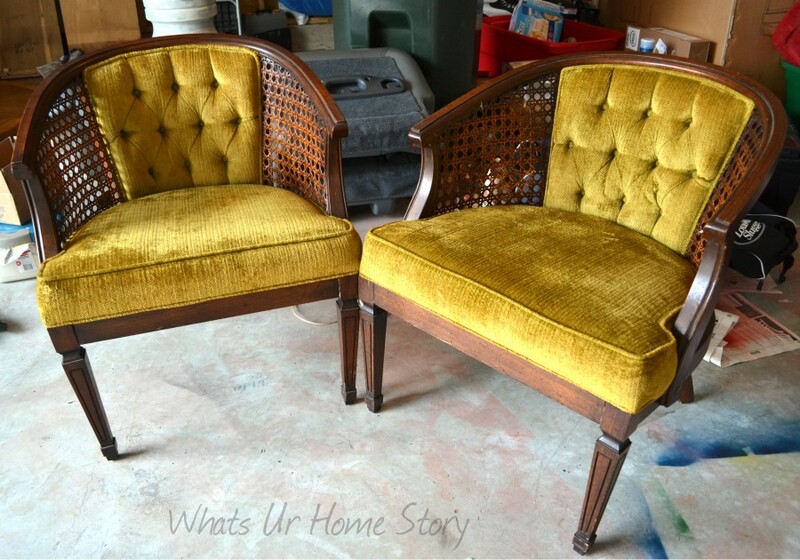 I have the same chairs, they were even the same gold upholstery before the recover. I have them in my bedroom. Would love to paint the stain but the hubby will not consent to me painting the bedroom suite so guess the chairs will have to remain stained. 🙁 I know how you feel. Sometimes we do have to pick our decorating battles. 😉 Aren’t those chairs super comfy? I would’ve never guessed they would be so great to sit on! Just found this post! I am the owner of two of these identical chairs, but my original upholstery is chocolate brown. My mom got them at Monkey Wards in the very late 70s. I’ve always considered them as just lackluster space-fillers, but now am SO excited to redo mine! I was going to paint the upholstery (something that ASCP does beautifully), but after seeing a couple posts like yours, I am going to take the plunge and reupholster– I don’t think it will be TOO complicated. But I would love to see more photos of your process and the completed chairs. And thx for the tip on the staple-remover!! So great to see your comments Kairi. Good luck with your chairs. Can’t wait to see yours.